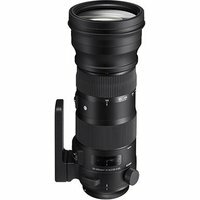 The Sigma 150-600mm DG OS HSM SPORT lens is a high-end, telephoto zoom designed to meet the demands that professional photographers require in challenging conditions. Dust and splash-proof, the lens sits in the new line-up of Sigma's 'Sport' lenses with an updated Optical Stabilisation (OS) system that improves vertical and horizontal panning, essential for wildlife and motorsports photography. The lens is compatible with the separately available Sigma USB dock.